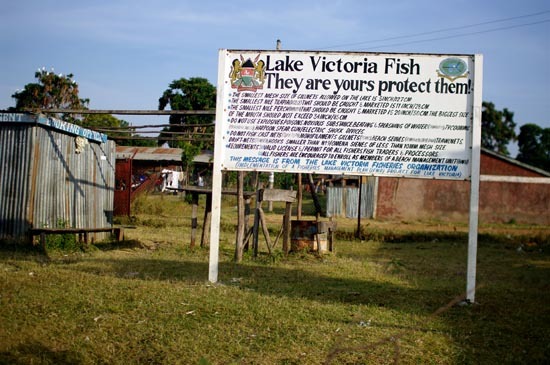 Located on the shores of Lake Victoria, Kisumu is a city known for its fish. 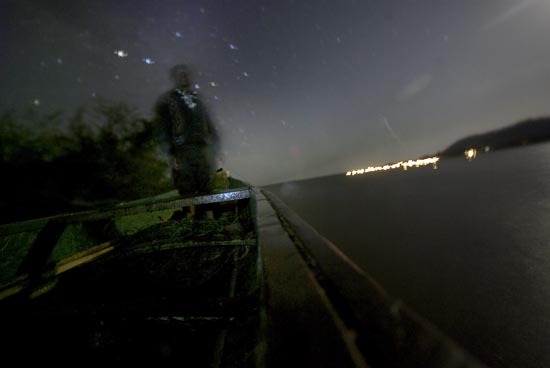 Lake Victoria is cool and dark at night, but the importance of fishing to the local culture led us to the lake one evening. We joined the captain of a 10 men fishing boat for a night of fishing, wading onto the rowboat at eight in the evening and staying on board until six the following morning. We crept along the beachside keeping the lights low. The fishing industry has suffered greatly of late, and the much sought after Nile Perch and Tilapia species are in decline. The fishermen are weary of police patrols who enforce regulations by force or by payment. Fishing here is a taxing profession. The men work all night long. They row out onto the lake, each stroke in rhythm, while the captain directs the boat from the stern. Once they reach their mark, they drop the net and row back to shore. On shore, the fishermen plant their feet firmly on the rocky lake bed and reign in the net by hand, one pull after another. Pulling in the nets alone can take over two hours. They store their catch and row out again. We take a break on the beach while the fishermen store their boat far from prying eyes. Two fishermen wait with us; one is called Junior and claims to be eighteen years old, although he looks considerably younger. The other, a man of 32, asks us if we see now how much fishermen struggle. He explains that many fishermen are orphans, and all are poor. But hard work pays, so every night he hikes up his shorts and heads out. It’s better then stealing and ending up in jail, he says. Sitting crouched in the bow, we become accustomed to the feel of fish beneath our feet. Looking up at the stars and across the dark lake, our eyes fall at times. The fishermen however, persist, feet dangling over the edge, they work mechanically, silently. In the end, their catch is still too small to turn a profit since most fish are too small to be sold. They will take the catch home to their families – to subsist another day.